Working across sectors and organizations, the East St. Louis community has come together to help young people feel safe and secure in their community, be ready to succeed in school and work and empower them to create change. “The State of the Movement is strong,” declared Montez Holton, a junior at East St. Louis Senior High School, referring to the East Side Aligned collective impact “movement” in East St. Louis, IL. Working across sectors and organizations, the East St. Louis community has come together to help young people feel safe and secure in their community, be ready to succeed in school and work and empower them to create change. One way Montez is making a difference is as member of the Youth Coordinating Council that works to dismantle health barriers for young people across East St. Louis and is supported by the GSK IMPACT Grant for Greater St. Louis. With GSK’s support, out-of-school time providers in the East Side Aligned network are supporting hundreds of students after-school and throughout the summer to increase healthy behaviors, improve school performance, and develop leadership skills. Additionally, this grant supports efforts to develop out-of-school time provider staff and engage young people like Montez to create their own solutions for making East St. Louis a healthier place to live and grow – like their recent creation of a yoga and meditation room painted in calming colors at Lessie Bates Neighborhood House. In total and including GSK’s $500,000 IMPACT Grant, East Side Aligned has already raised $2.5 million to support workforce readiness, youth programming and community safety improvements in line with the movement’s roadmap and collective priorities. During Friday’s State of the Movement event, leaders from across the East St. Louis community celebrated this truly collaborative effort to improve outcomes for young people. There is still much to do, but with East Side Aligned residents of East St. Louis are moving forward to make their community even better. 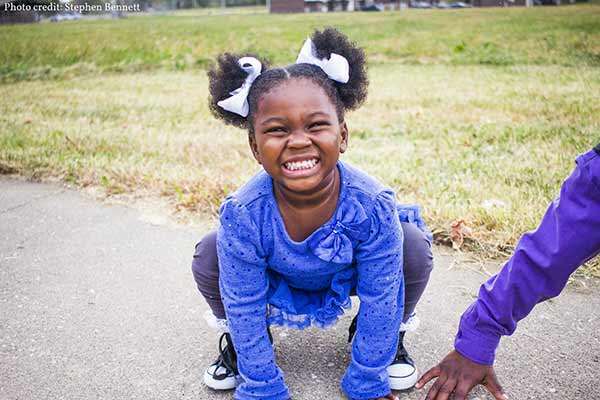 GSK is so proud to be a small part of this community-led effort to tackle complex issues and advance equity for young people in East St. Louis.